This entry was posted on May 20, 2014 at 7:50 pm and is filed under Art and War. You can subscribe via RSS 2.0 feed to this post's comments. Great post, Peter. I will read this book. Thank you for drawing attention to some overlooked books. All fair assessments, but who says fiction has to reflect only good units or good soldiers? We all know bad ones exist; why not represent it? Even if the bad isn’t, on average, representative, it is myopic to suggest they should not exist in your hallowed genre. What if they were completely made up, with no correspondence to reality? You’d have “Catch-22.” There are so many other ways to thanks us for our service, why must fiction ALWAYS continue that project? Reading this post got me thinking about my own time as a soldier–the good and the bad–and I’m glad to see women’s voices finding, or creating, a place in war literature. I’m not sure that I want to read the novel, which is by no means a slight against your review, or even the novel, but I am off to check out Kayla Williams’ blog post right now, and I’ll certainly be looking at some of the other works you referenced. Great post! Great post–your summer reading list is much like mine! I think you hit the nail on the head — with Benedict, agitprop comes first and art second. I appreciate what she is trying to do in improving conditions for female service members, particularly the more concrete suggestions she put forth in “the Lonely Soldier” — trying to avoid massive disparities in male:female ratios within units where possible, as a starting point — but her view of the military is so relentlessly bleak that after a certain point I just start drifting away. She seems to find the military incomprehensible and degrading to all of its members; what she describes, I hardly recognize. Thanks for your comments, everyone. Dave, I’m not so sure we disagree–I think we need more, not less, portraits of screwed-up units and fundamentally bad people serving as soldiers. And I love your Kenneth Burke quote. I wonder if Burke was aware of the great Viktor Shklovsky dictum that art’s purpose is “to make the stone stoney”? 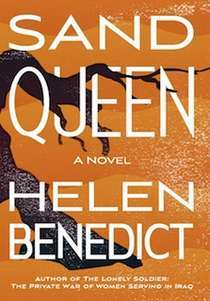 Andria, Sand Queen is definitely in the tradition of Uncle Tom’s Cabin and the muckraking social realist novels of the early 1900s, not that that’s such a bad thing. To quote yet another Russian formalist critic, Mikhail Bakhtin, all novels are “moral propaganda.” Though Sand Queen wasn’t true to my overall sense of how women are serving alongside men in the military, a woman whose tour-of-duty was horrible might find a lot to relate to. And, back to Dave’s point, the story of a badly-functioning unit that is preoccupied by internal issues is one that needs telling. Kristin and Lesa, not only are our wars now changed by the presence of women in uniform, so too will our war literary tradition be transformed by the addition of large numbers of female voices.